Let your creativity run wild with Cubo! This innovative set of 12 storage cubes by Niche are designed to fasten together in any direction! Connect them in any way you like. In a row, in a pyramid, in a U or L shape or countless other configurations. Start small and add on later. Cubes connect to one another with spring pins, making it easy to customize and create a storage system just for you with a single cube to a set of 12 or more. Niche storage cubes are acutally cubes! The Fabric Storage Bins measure 12 x 12 x 12, which integrate seamlessly into Niche Cubo storage cubes (interior dimensions 12 1/8" x 12 1/8" x 12 1/8"). There's no "right" way to use them because all sides measure the same! Who ever said all cubes had to face the front like a bookcase? Cubo storage cubes can attach together in any direction, which opens up a myriad of new design possibilities. Turn one to the right, turn another to the left. Keep one facing front and still another facing the back. 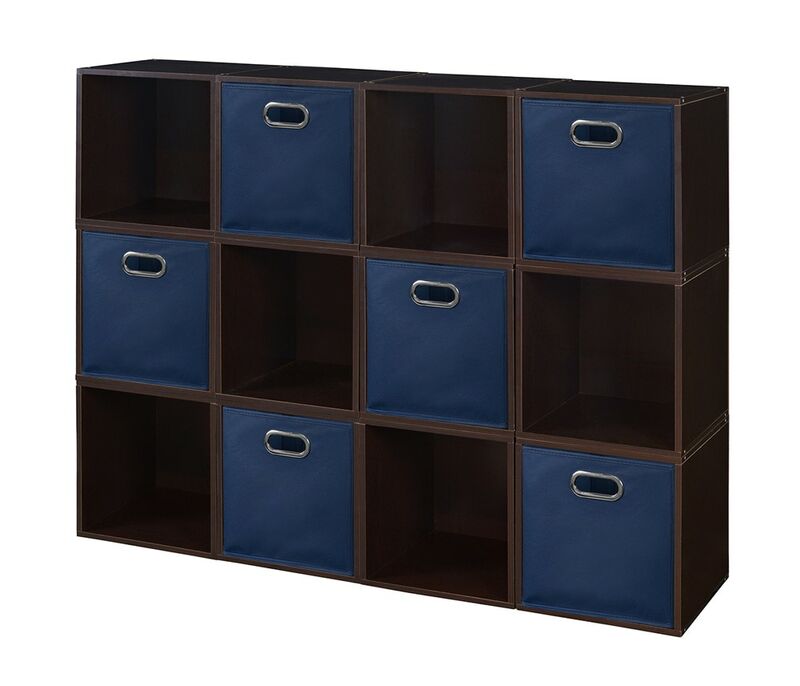 Perfect to clean up clutter in closets, entryways, laundry & storage rooms, as a bookcase, nightstand or media storage, in a classroom or children's room-these cubes fit anywhere! Its rich dark Truffle finish shows subtle wood grain and is sure to please and coordinates with the rest of the Niche line. No tools LockDowel assembly allows pieces to simply snap together and lock into place for a sturdy, hassle-free build in less than 2 minutes. No more searching for the right size screwdriver or dropping tiny screws. Just snap into place and go. Less hardware and fewer small parts means less plastic packaging and less waste. Arrange and rearrange the 6 Blue Foldable Fabric Bins for a fresh, new custom look whenever you like! LET YOUR CREATIVITY RUN WILD! Connect these 12 Cubo storage cubes together in any way you like. In a row, in a pyramid, in a U or L shape or countless other configurations. Add on as much or as little as you need to existing Cubo cubes. Cubes connect to one another with spring pins making it easy to customize and create a storage system just for you.